camping, hiking, hunting, fishing, gardening, trekking, trip to the beach, etc. dig fire pits, open your favourite bottle of beer. Use as an emergency tool in your vehicle or garage. 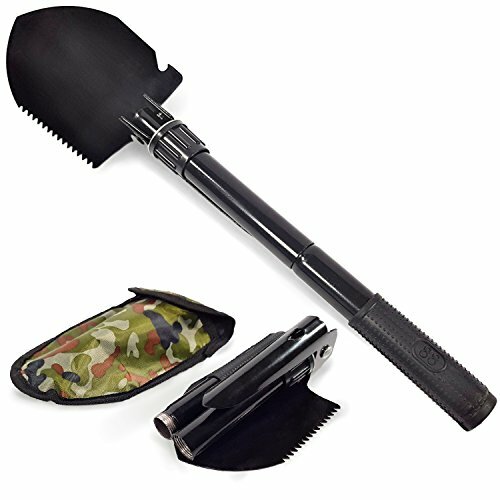 ★ Multifunctional 6 in 1 tool ★ - Tactical shovel combines a great amount of tools like shovel, picking axe, saw, nail puller, beer opener, and compass. You can find it useful in a variety of outdoor activities like camping, hiking, fishing, hunting, gardening, trekking and more. ★ Convenient and Easy-to-Use ★ - Use as a hoe or crowbar, chop or saw branches, dig pits or use during snow season, break stones and brick with this extremely convenient survival tool. Can also be used for self-defense. ★ High-grade Material ★ - The body of this shovel is made of high-carbon tempered steel; it has a steel handle for extra durability and a wear-resistant stainless steel spade. The handle has soft but firm rubber non-slip grip for higher skid resistance that feels very comfortable in your hand. ★ Compact ★ - This is one lightweight and compact foldable multifunctional tool with only 41.5cm in length when used as a shovel or pickaxe. When folded it is as big as the palm of your hand. ★ Portable ★ - The carrying camouflage pouch has a convenient Velcro opening and can be easily attached to your belt on your waist or hiking backpack. This multi-purpose shovel is an ideal tool for camping, hiking, hunting and even gardening. You can easily store it in your car or garage as an emergency tool. If you have any questions about this product by Bullzen, contact us by completing and submitting the form below. If you are looking for a specif part number, please include it with your message.